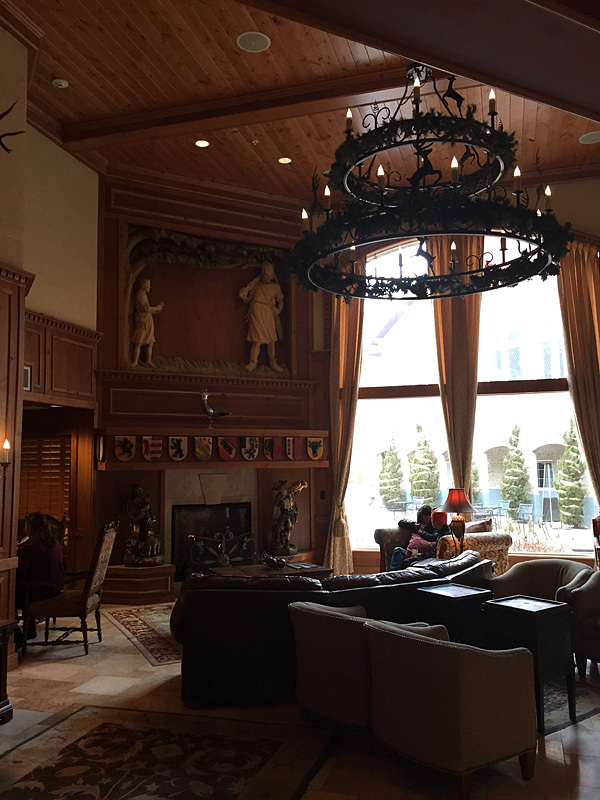 Up pretty early (7:00am) to pack and move to the Swiss-themed Zermatt Resort for my last two days here (that’s the lobby in the picture above.) I got myself over to the Eccles in plenty of time to be picked up by the Zermatt shuttle at 10:00am. In fact, it arrived around 9:35am to drop off people, so I got on. The driver had another passenger to drop off at the Canyons ski resort so I went along for the ride. She stopped back at Eccles at 10:00am again, but nobody else got on. I didn’t catch her name, but she’s a young, presumably Mormon, woman who works as a bellhop for the resort. She told me she’s lived in Heber (the town near where the resort is located) almost all of her life, and has never attended a Sundance film. She also told me she’d never seen a drunk person until a year ago. She was incredibly friendly and sweet, but you get the feeling that for her, Sundance is kind of a freakshow. I had enough time to check in and eat a filling though expensive ($20!) breakfast in one of the hotel’s restaurants, but misjudged the next shuttle back to Eccles. I thought it left at noon but it actually didn’t go until 1:00pm so I was late getting into the Film Office. But of course there was nothing much to do at the Film Office. I got through the afternoon, helped by the arrival of an invite to “a small swimming pool party” that evening from the lovely team behind documentary short Object, which had won a Special Jury Award for Visual Poetry at the Shorts Awards two nights before. I had met producer/sound designer Kasia Szczerba at Hot Docs last spring when she was there as part of the team with The Supreme, another documentary short film. I’d enjoyed meeting that team and had drinks with them a few times. When I saw Kasia for the first time at Sundance, we both recognized each other but it took a few minutes to figure out from where. In any case, she and her team have been incredibly friendly and a social invite, especially to something small, was just what I needed. I’m not a swimmer, nor did I bring any suitable swimwear, so I didn’t expect to actually be in the pool. When I arrived at their condo, it turned out to be just their film team and my FOC, Kevin. I’d brought some beers and snacks, which I’d bought at Fresh Market. Interesting observation: beer is for sale in the grocery store but it all has to be 3.2% alcohol. 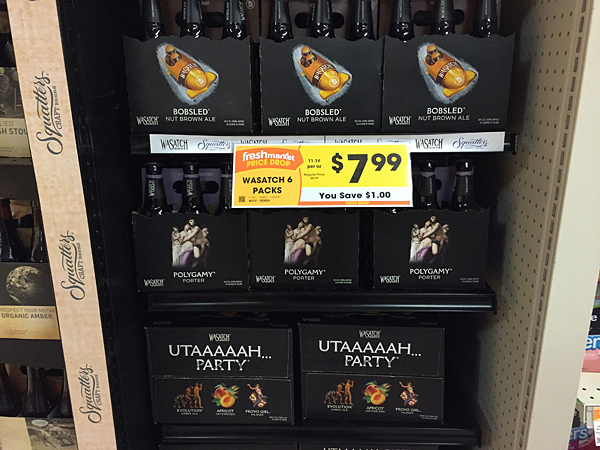 The same brands bought at a Utah state liquor store can be whatever alcoholic strength they want. Odd. We chatted and drank beer (and Polish vodka!) for an hour or so and then we headed for the outdoor heated pool! It was more of a large hot tub since it wasn’t very deep and it had jets to churn up the water. It had been snowing steadily all evening and so I went out in my coat while the rest of them got into the pool. It wasn’t long before they were encouraging (maybe begging is more accurate) for me to come in. I’ll have to admit that the prospect of joining four beautiful Polish women in a large hot tub was impossible to resist, and so I stripped down to my underwear (!) and joined them. It was the best experience I had at Sundance and might be hard to top for best experience of 2015. We spent almost two hours just soaking, chatting, and drinking while the snowflakes drifted lazily down into the warm water. Getting out wasn’t as much fun. I’d hidden my clothes under a blanket but everything was still very cold and running through freshly fallen snow in bare feet was painful. But it was worth it. Kevin left soon afterward to go another party with some of his Sundance colleagues from last year. I stayed and shared some of my personal stuff with the women. It was the kind of connection I’d been craving and it was wonderful to share our real lives and not just our professional ones for a while. Shorts programmer Jon Korn and his wife dropped by for a little while, since they were staying in the same condo complex, and I soon realized I was going to miss the last shuttle back to Zermatt. Luckily, the ladies had a spare couch, which I happily occupied until about 6:30am the next morning.